Just as I suspected, Mayor Sly James is not going to be bullied by the ministers and black political leaders, and he opposes renaming The Paseo after Martin Luther King Jr.
After James issued a news release yesterday saying he would be announcing today a commission to determine how to honor King in an appropriate way, The Star’s Bill Turque interviewed the mayor about the issue. The interview is the subject of the lead story on The Star’s website this morning. The mayor told Turque he was convinced there was a more meaningful way to honor King than name a street after him — especially a street in what is largely a black residential area. If Martin Luther King was fighting for equity, inclusion, equal rights and dismissal of segregation, then I think we ought to find a way that does something that actually honors that legacy, as opposed, frankly, to just automatically renaming a street in a segregated part of town and creating yet another dividing line. …I just don’t know how that honors Dr. Martin Luther King. I don’t say that having a street named after him isn’t an honor. But I’ve been to other cities where there are MLK streets. None of them are in any parts of town that have any economic activity or anything going on that I’ve been able to see. And I just don’t know how that honors the man. Then he brought down the hammer on those who are advocating the change and — more significantly — have indicated no willingness to compromise. With those words, James has probably killed the proposal: It doesn’t have a chance of getting through the City Council or past the voters without buy-in from the most popular mayor KC has had at least since H. Roe Bartle more than 50 years ago. So, today it’s Bravo, Mayor James! You are right on target, and again you have shown exceptional courage in standing up to the fearsome Freedom Inc. and a bull-headed band of black ministers. I doubt if there’s a handful of people in Kansas City who don’t favor honoring Dr. King in a major way, but I think the vast majority of city voters will trust James’ judgment over that of a self-centered group of people who are acting like kids refusing to share the ball in the schoolyard. I am a strong proponent of term limits-especially in our dysfunctional senate/congress. That being said your point on Sly’s popularity is so true and i’ll be sad to see him leave when his term ends. Very large shoes to fill. Take another look at that photo. It’s hard to resist a guy who takes a photo of himself in a rainbow-colored bowtie. Actually, I don’t think the majority of voters have much confidence in James’ judgment after the airport fiasco. But, time will tell how things go from this point. If all this ends up with a relatively amicable consensus, I will be pleasantly surprised. Just this week, 75 percent of the voters approved a 20-year renewal of the one-cent, capital improvements sales tax, including a controversial set-aside for a new Buck O’Neill Bridge…You don’t get those kind of numbers without an extremely popular mayor…Strongly disagree with the rationale. “You don’t get those kind of numbers without an extremely popular mayor.” Actually, we got those numbers in spite of the Mayor, not because of him. To state the obvious, his judgment is woefully poor on too many occasions. This dispute over what to name after MLK Jr is merely the latest example. In announcing his committee, James said “I don’t want this issue to … get contentious.” That’s both funny and ridiculous. He only formed the citizens’ group now because the matter has become contentious. In any event, I’m done with this issue. I am not going to spend any more time thinking about this when Kansas City has so many other critical issues to address. If the switch from the Paseo to MLK Jr ever does get on the ballot, I will vote in favor of it. Other than that, I am moving on. Now if he would just take that same courage and go into the inner city and talk about the cultural issues that have black children slaughtering one another on the streets. 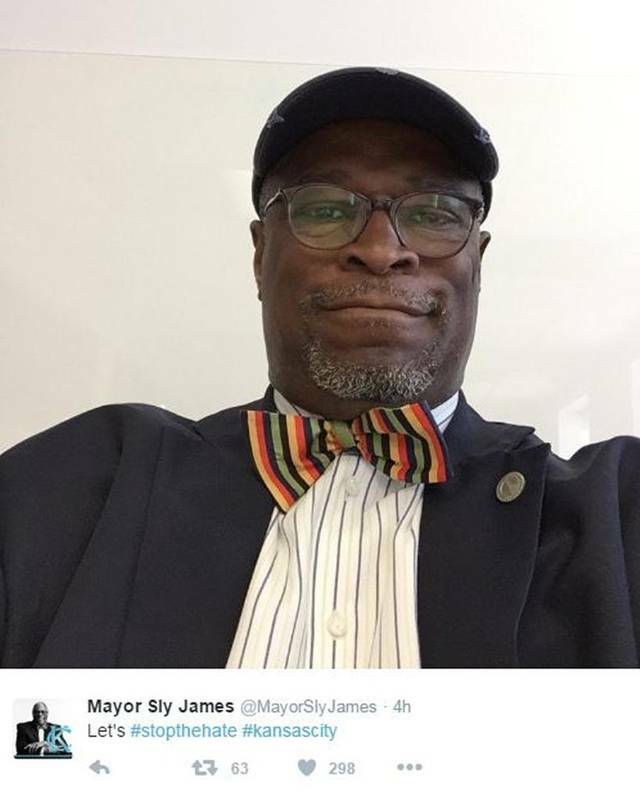 Good for Mayor James. Dr. King has been dead a half-century. Why the rush now to name a street for him? Many possibilities should be considered; maybe the stretch of I-70 across KC could be the Martin Luther King Expressway; perhaps the City Hall building could be named the Martin Luther King City Government Tower; how about calling the new airport Martin Luther King-Kansas City International Airport. Just take time to think this out. I was thinking about the new airport, too, Les…I Googled MLK Jr. International Airport, and I don’t think any major city has named its airport after him. It would certainly add luster to the name Kansas City International. I find this whole name-naming issue borderline ridiculous. The only people who care are the politicians and those people who influence the politicians. After all the city has a bridge named after a pork-deliverying former Republican U.S. Senator and a boulevard named after a centralist Democratic congressman. At least Dr. King and greatness are linked; can’t say that for most of the other nameplates around the city. Like it or not, something big is going to be named for him…Kansas City is late getting on board (despite having a low-profile park bearing his name), and the push is on to compensate, or overcompensate. The mayor issued another press release this afternoon announcing the names of the people who will be on his MLK advisory commission. I know Collins, Hill, Miles and Wesson. They are strong and outstanding people. I think this commission will come up with an excellent recommendation. Nothing like a committee to make sure everyone can pass the buck. I like the idea of the airport, Fitz. That’s the best one so far. Also appropriate that it would be up north since King was a pro-life Republican.